You may think that what you’re doing is literal; going outside to breathe in the fresh air. But there’s a much deeper connection to the outdoors that our bodies are desperate to access. This is why we find so much solitude in the outdoors. To break away from the stresses of our busy and everyday lives, many like to retreat to nature to reconnect with themselves and clear their minds. However, when we attempt to find a deeper and more spiritual meaning to life, what we’re really doing is asking our inner monologue a different type of question. These two mindsets are supposed to work together. When your soul is in crisis and you need to strengthen your spiritual connection, clearing yourself from stress and centering your focus will bring these two mindsets back into balance. Since we are so immersed into a scientific and stressful culture, your spiritual connection to the Earth may be broken easily. What many do not realize is that if you strengthen your spiritual connection to nature, your scientific connection to life will have more meaning as well. 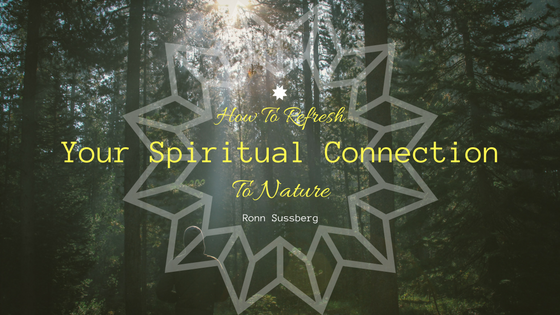 Here are some ways to reconnect your spiritual relationship with nature, grounding your strength of character and sense of self. Leave your shoes at home and walk through nature barefoot. Feeling the grass and absorbing the natural minerals from the earth will give an instant and tangible connection. Listen to silence. Observe what is going on around you and take it all in. Imagine where the sounds are coming from and what they could mean. Remember that you are never alone. Communicate with the nature around you. While observing nature, listening to it’s calls and finding your place inside of it, try to find ways that nature speaks to you and how you can use these observations in your life. Take weeds for example; they are stubborn, and although they are attacked and discarded often, they try with all of their might to grow again against all odds. While weeds are typically cumbersome, there are lessons here that you can take to your everyday life. Always strive to make your presence known, as nature always does. This takes practice, but it is worth the lessons rewarded in the end. Have your recently connected with nature? Did you discover a new sense of spirituality through nature’s gifts? Tweet your experiences to me @ReadingsByRonn, and share your wealth of knowledge with others.